This is another recipe inspired by http://www.lemonsandbasil.com. Her posts are so lovely and probably more healthy than mine… but they always inspire me. 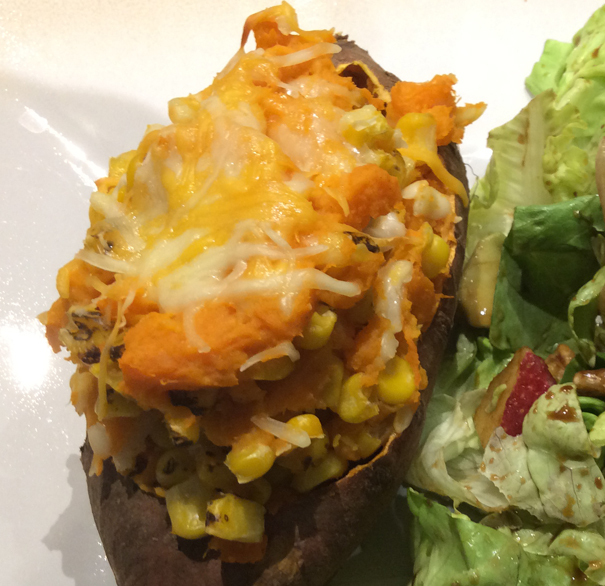 I would not have thought of BBQ meat combined with a sweet potato but it is wonderful. 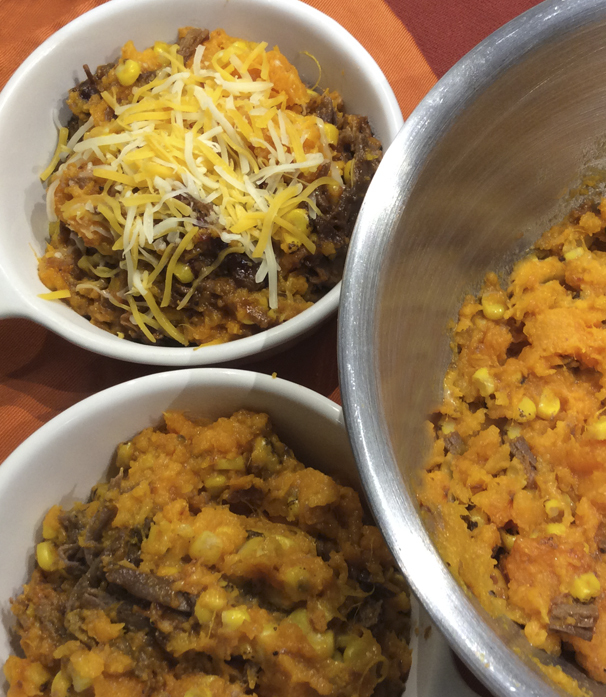 I have made this twice, once as a vegetarian meal without the meat (using only caramelized onions, roasted corn and Cojita cheese) and once following this recipe. We loved both versions but this is my favorite. You could use beef, chicken or pork. I had BBQ beef brisket in the fridge so I went with that. The first time I used fresh roasted corn but frozen works just fine. Wash sweet potatoes and prick each one several times with fork. Place on a foil lined or non stick baking sheet and bake at 375 for 45-60 minutes or until they are soft to the touch. I used a convection oven so it took only about 45 minutes. Warm the BBQ beef in the oven at 350 for about 15- 20 minutes. Heat olive oil in a large saucepan and add the sliced onions. Cook for about 20 minutes until golden and caramelized. For frozen corn: use a non stick pan to toast over medium heat to give it a bit of caramelizing; about 5-7 minutes. For fresh corn: Grill for a few minutes on each side and slice kernels off the cob OR Slice corn off the cob and toast in a pan for about 4-5 minutes. 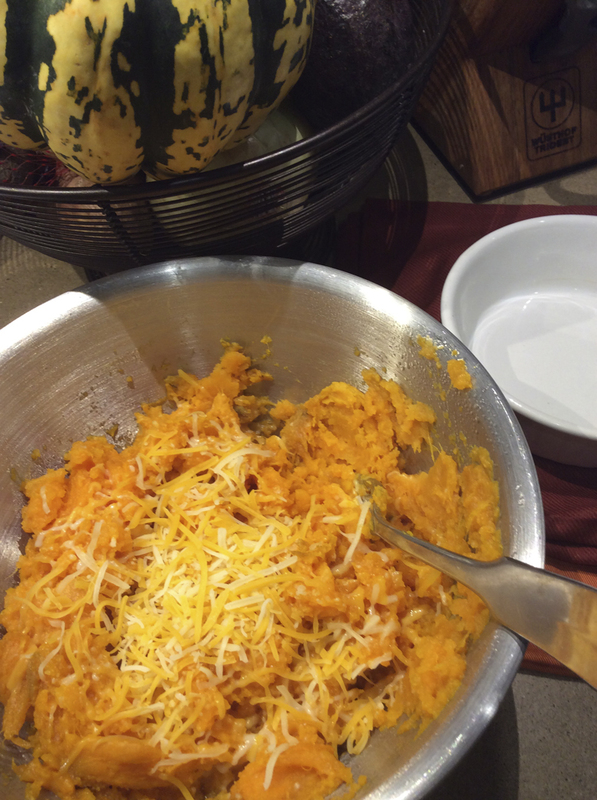 When the potatoes are done, cool for a few minutes then remove the skin and place sweet potatoes in a large bowl. Mash with a fork and add 1/2 the cheese, onions, corn and fold in the shredded BBQ. Mix well. Sprinkle with remaining cheese. Place the filling In oven safe dishes and bake just until the cheese is melted. This is my vegetarian version. 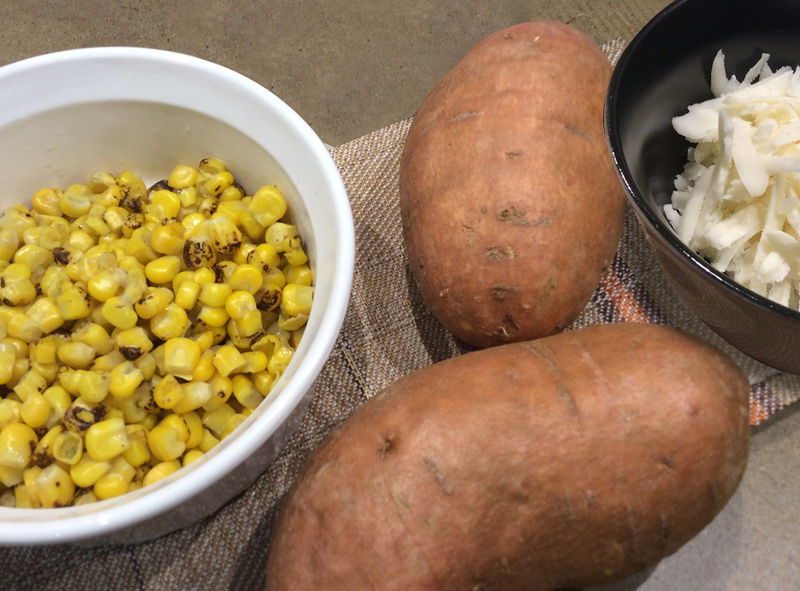 Once the sweet potatoes are cooked, allow to cool for a few minutes, then cut off the tops and scoop out the cooked flesh of each potato, add to a large bowl. Leave the skin of the potatoes intact along with a thin layer of potato to help hold skins together. Mix all the ingredients and then scoop sweet potato filling into the skins, drizzle with BBQ sauce, top with cheese and bake for 6 or 7 minutes until cheese is melted. I served with a greens and apple salad. 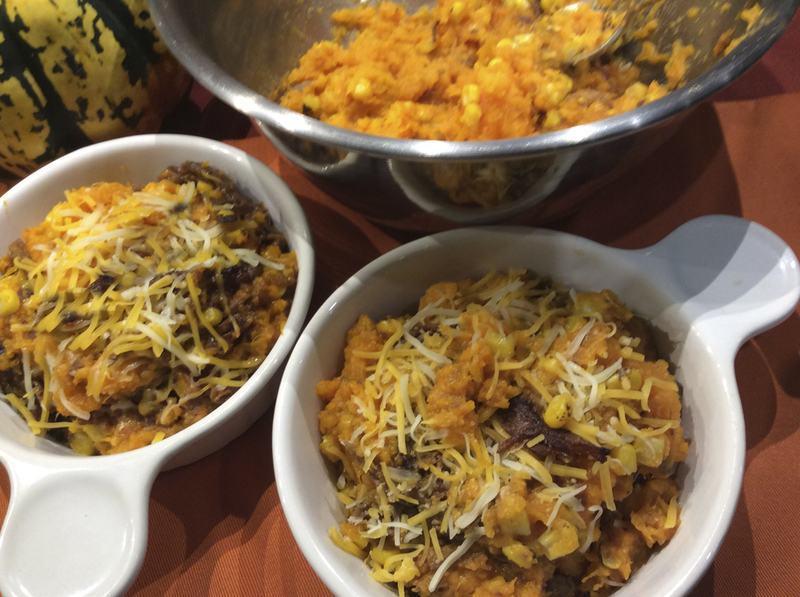 This entry was posted in Main Dish, Sweet Potato, Vegetarian. Bookmark the permalink.